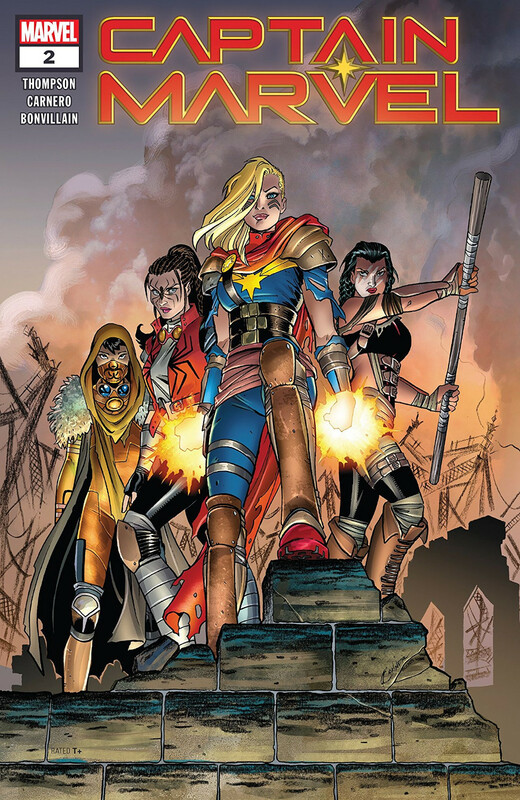 Captain Marvel #2 wastes no time in getting down to post-apocalyptic time-bubble business. Wait, I tell a lie. The first page is given to "vox pop" reactions that recap the last issue and also deliver an unnecessary dose of "what do people think about Captain Marvel?" commentary. But that's the last we see of the "Captain Marvel's PR problem" plot for now. And then it's down to business, with Carol trading super-punches with Mahkizmo and teaming up with the Rebellion of Roosevelt Island just in time to drive him off. Conditions on the ground are dystopian as all get-out. The Nuclear Man has locked Roosevelt Island behind a tricksy barrier that only lets women pass. ("Gross.") Time is passing faster on the island; Echo has logged 50 days inside and Spider-Woman and Hazmat have been in for weeks. Carol reunites warmly with Jess and then takes the Rebellion in hand, Captaining it up like crazy. Mahkizmo reigns over the island from his Citadel ("Yeesh.") and the heroes have been safeguarding all the women they can find. The balance of the issue takes us through Carol's assumption of leadership and a good old robot fight. An impressive amount of attention is devoted to explaining the situation in the best possible way - by focusing on the impact it's having on the women involved. Carol is magnificently characterized as a real leader. She has worries about the situation, but they live strictly inside her inner monologue. In her speech, she projects confidence and strength because that's what the Rebellion needs. I love a tiny touch dropped on the start of the second act: Carol takes a panel to insist that the civilian reporter, Ripley, gets her minor injuries treated properly. "You want to get an infection in this place?" It's an inventive and effective way to let Carol demonstrate compassion and common sense. To digress, it puts me in mind of a tiny moment tucked into Carol's first solo, back in the 70s. 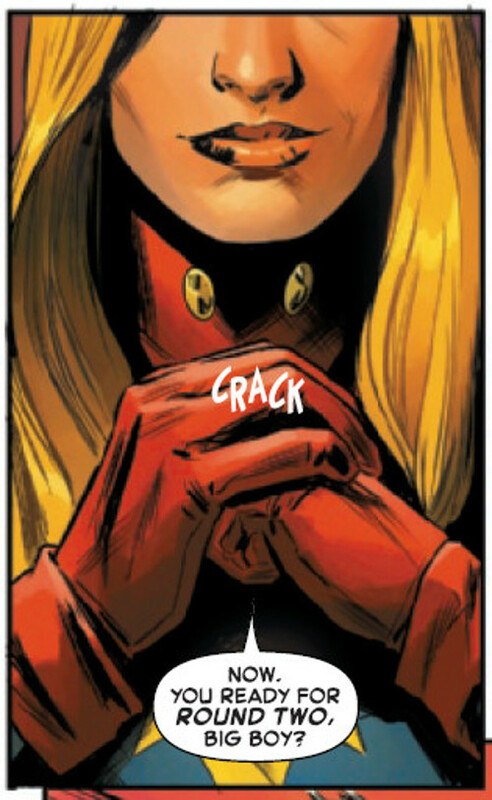 This was when Carol Danvers and Ms. Marvel were separate people with a turbulent body-swap relationship. Ms. Marvel was doing some standard-issue fire-fighting and Carol's thoughts compelled her to hug a young evacuee so he wouldn't go into shock. It taught the Kree warrior something important about compassion and it taught readers that this "Chris Claremont" fella was a force to be reckoned with. So, am I saying that there's a very positive Claremont-esque vibe to the thoughtful way Carol is taking care of business in this issue? Yeah, I guess I am. This issue is a treat on the visual front, too. While the post-apocalyptic aspect of the setting isn't ground-breaking, the amount of detail lavished on it is noteworthy. The Rebellion's base is packed with realistic characters and weaponry, and there's an impressive amount of real life going on in the backgrounds. The heroes who have been trapped on the island need some fresh design work, and that's carried off brilliantly. Spider-Woman's spider-warpaint is terrific, and Hazmat's dystopian protective gear is one of the best looks the character's ever had. The heroes look great whether they're just standing around and talking or getting tore into Mahkizmo and his robot minions. They do plenty of the latter; this issue is long on action and it looks outstanding. The colour work is also very strong; the colourist and artist are collaborating closely to bring the characters and settings into deep three-dimensional life. I do think there was one missed opportunity: The brief "outside the bubble" scene at the beginning is coloured with the same rich sundown palette as the island scenes adjacent to it. Changing up the times of day and the colours could have emphasized the timey-wimey shenanigans going on. When it comes to plot, this is an impressively crafted comic. The main story is woven together with great skill, conveying the reader smoothly and all too quickly through a significant amount of development. But carefully-tended threads of foreshadowing poke out of the fabric, delivering tempting hints about the future. Captain Marvel #2 feels like a demonstration of the status quo the creators want to set for this volume: brisk, exciting, tough, compassionate, and funny in a charmingly subtle way. It's put together with formidable skill both visually and narratively. If future issues hold to this level of quality, this whole series is headed into must-read territory. I love it when creators plug the exact plot holes I'm thinking about: Yes, X-23 and Honey Badger live on Roosevelt Island. No, they weren't at home when Mahkizmo rolled in.